February 8 is the 39th day of the year in the Gregorian calendar.There are 326 days remaining until the end of the year(327 in leap years). 1575 – Leiden University is founded,  and given the motto Praesidium Libertatis. Year 120 (CXX) was a leap year starting on Sunday of the Julian calendar. At the time, it was known as the Year of the Consulship of Severus and Fulvus. The denomination 120 for this year has been used since the early medieval period, when the Anno Domini calendar era became the prevalent method in Europe for naming years. Vettius Valens was a 2nd-century Hellenistic astrologer, a somewhat younger contemporary of Claudius Ptolemy. Year 412 (CDXII) was a leap year starting on Monday of the Julian calendar. At the time, it was known as the Year of the Consulship of Honorius and Theodosius. The denomination 412 for this year has been used since the early medieval period, when the Anno Domini calendar era became the prevalent method in Europe for naming years. Saint Severus the Great of Antioch, also known as Severus of Gaza, was the Patriarch of Antioch, and head of the Syriac Orthodox Church, from 512 until his death in 538. He is venerated as a saint in the Oriental Orthodox Church, and his feast day is 8 February. 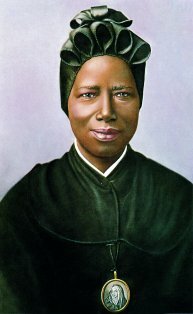 Josephine Margaret Bakhita,, was a Sudanese-Italian Canossian religious sister active in Italy for 45 years, after having been a slave in Sudan. In 2000 she was declared a saint by the Catholic Church. Saint Iuventius was a bishop of Pavia during the 1st century. Together with Syrus of Pavia he was sent there by Saint Hermagoras. Both Iuventius and Syrus are reported to have been the first bishop of Pavia. Saint Meingold is said to have been count of Huy, who was murdered by his opponents in 892. It is possible that the holy Meingold was a different person confused with the count, with both having been killed in the same year. Saint Cuthmann of Steyning, also spelt Cuthman, was an Anglo-Saxon hermit and church-builder. Saint Ælfflæd (654–714) was the daughter of King Oswiu of Northumbria and Eanflæd. She was abbess of Whitby Abbey, an abbey of nuns that were known for their skills in medicine, from the death of her kinswoman Hilda in 680, first jointly with her mother, then alone. Ælfflæd was particularly known for her skills in surgery and her personal attention to patients, as was Hilda, who was known for her personalized medical care. Gerolamo Emiliani, was an Italian humanitarian, founder of the Somaschi Fathers, and saint. He was canonized in 1767 and is the patron saint of orphans. ↑ Salis (1867). 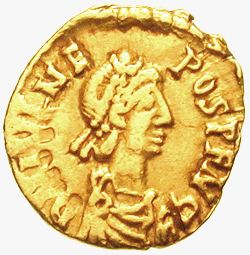 The Coins of the Two Eudoxias,Eudocia,Placidia, and Honoria and of Theodosius II,Marcian, and Leo I, Struck in Italy. p. 3. ↑ Clifford J. Rogers (2010). The Oxford Encyclopedia of Medieval Warfare and Military Technology. Oxford University Press. p. 567. ISBN 978-0-19-533403-6. ↑ Manfred Horstmanshoff (25 October 2010). Hippocrates and Medical Education: Selected Papers Presented at the XIIth International Hippocrates Colloquium, Universiteit Leiden, 24-26 August 2005. BRILL. p. 11. ISBN 978-90-474-2595-3. ↑ Chris Brennan (10 February 2017). Hellenistic Astrology: The Study of Fate and Fortune. Amor Fati Publications. pp. 106–. ISBN 978-0-9985889-0-2. ↑ Rudolphus Maria Berg (1 January 2001). Proclus' Hymns: Essays, Translations, Commentary. BRILL. pp. 3–. ISBN 90-04-12236-2. ↑ Jere L. Bacharach (2006). Islamic History Through Coins: An Analysis and Catalogue of Tenth-century Ikhshidid Coinage. American Univ in Cairo Press. pp. 21–. ISBN 978-977-424-930-3. ↑ Joseph L. Wieczynski (1994). The Modern Encyclopedia of Russian and Soviet History. Academic International Press. ISBN 978-0-87569-064-3. ↑ E. Michael Gerli (4 December 2013). Medieval Iberia: An Encyclopedia. Routledge. pp. 36–. ISBN 978-1-136-77162-0. ↑ Encyclopedia of World Biography. Gale Research. 1998. ISBN 978-0-7876-2544-3. ↑ Peter G. Bietenholz; Thomas Brian Deutscher (2003). Contemporaries of Erasmus: A Biographical Register of the Renaissance and Reformation. University of Toronto Press. p. 2. ISBN 978-0-8020-8577-1. ↑ Titian; Susanna Biadene; Mary Yakush (1990). Titian: prince of painters. Prestel. ↑ John Flower (17 January 2013). Historical Dictionary of French Literature. Scarecrow Press. pp. 42–. ISBN 978-0-8108-7945-4. ↑ "Burton, Robert". Oxford Dictionary of National Biography . Retrieved 12 October 2018. ↑ National Gallery of Ireland (1867). Catalogue, Descriptive and Historical, of the Works of Art in the National Gallery of Ireland: With Biographical Notices of the Masters. Alex. Thom. p. 35. ↑ Joseph Haydn; Benjamin Vincent (1868). Specimen Pages, Prospectus, & Opinions of Haydn's Dictionary of Dates: Comprehending Remarkable Occurrences, Ancient and Modern, the Foundation, Laws, and Governments of Countries; Their Progress in Arts, Science and Literature, Their Achievements in Arms; and Their Civil, Military, Religious and Philanthropic Institutions, and Particularly of the British Empire. E. Moxon. p. 247. ↑ Gilbert Faccarello; Heinz D. Kurz (27 July 2016). Handbook on the History of Economic Analysis Volume I: Great Economists Since Petty and Boisguilbert. Edward Elgar Publishing. p. 40. ISBN 978-1-78536-664-2. ↑ Randel Don (1996). The Harvard Biographical Dictionary of Music. Harvard University Press. p. 332. ISBN 978-0-674-37299-3. ↑ Alison Latham (2004). The Oxford Dictionary of Musical Works. Oxford University Press. p. 195. ISBN 978-0-19-861020-5. ↑ Arnold McNaughton (1973). The book of kings: a royal genealogy. Garnstone Press. ISBN 978-0-900391-19-4. ↑ Joseph Haydn (1869). Haydn's Universal Index of Biography from the Creation to the Present Time: For the Use of the Statesman, the Historian, and the Journalist. E. Moxon, son, and Company. pp. 242–. ↑ Donald C. Pfanz (9 November 2000). Richard S. Ewell: A Soldier's Life. Univ of North Carolina Press. pp. 5–. ISBN 978-0-8078-8852-0. ↑ Rachel Dickinson (2009). John Ruskin's Correspondence with Joan Severn: Sense and Nonsense Letters. MHRA. pp. 283–. ISBN 978-1-905981-90-8. ↑ Robert P. Broadwater (25 April 2013). William T. Sherman: A Biography. ABC-CLIO. pp. 1–. ISBN 978-1-4408-0061-0. ↑ Eric Le Calvez (2004). Gustave Flaubert: A Documentary Volume. Gale. ISBN 978-0-7876-6838-9. ↑ Harold Philip Moon (January 1976). Henry Walter Bates FRS, 1825-1892: explorer, scientist, and Darwinian. Leicestershire Museums, Art Galleries, and Records Service. ↑ Jules Verne (17 November 2014). The Exploration Of The World: eBook Edition. Jazzybee Verlag. pp. 4–. ISBN 978-3-8496-4648-6. ↑ Robert Elsie (2010). Historical Dictionary of Albania. Rowman & Littlefield. pp. 195–. ISBN 978-0-8108-6188-6. ↑ Anne Commire (12 December 2000). Women in World History. Gale. ISBN 978-0-7876-4069-9. ↑ "Cliff Allison". The Independent. 9 April 2005. Retrieved 12 October 2010. ↑ Lindsey C. Harnsberger (October 1996). Essential Dictionary of Music: Definitions, Composers, Theory, Instrument & Vocal Ranges. Alfred Music Publishing. pp. 238–. ISBN 978-0-88284-728-3. ↑ Rédaction, La (2015-04-06). "Samedi dernier au Sacré-Cœur de la Gombe: Pensée pieuse en mémoire de Marcel Lihau et Sophie Kanza". Groupe de Presse l'Avenir (in French). Retrieved 2018-08-21. ↑ "Index entry". FreeBMD. ONS. Retrieved 29 April 2018. ↑ "Kirk Muller's Biography". Personal website. Retrieved 12 October 2018. ↑ Russell, Mallory (February 27, 2012). "Meet Progressive's Flo: Standup Comic Stephanie Courtney". Business Insider. Retrieved 5 February 2018. ↑ Beanz Smalls, Bernard. "FLY Interviews: Get Familiar With Star of NBC's New Comedy The Good Place!". Stuff Fly People Like. Retrieved February 4, 2019. Establishes birth date as February 8. ↑ Léon, Felice (January 22, 2019). "An Unexpected Adonis: Actor William Jackson Harper Has Found His 'Good Place'". The Root . Establishes age as 38 in January 2019, making his birth year 1980. ↑ Soloski, Alexis (September 14, 2018). "Why William Jackson Harper of 'The Good Place' Can't Quit the Theater". The New York Times . Establishes age as 38 in September 2018, making his birth year 1980. ↑ "エビ中・松野莉奈さん、18歳で急死 7日のコンサートを体調不良で休む". Sanspo.com (in Japanese). Sankei Digital. 8 Feb 2017. Retrieved 9 Feb 2017. Wikimedia Commons has media related to February 8 .